Book Point bookstore is located within Singapore’s Bras Basah Complex, at 231 Bain Street. 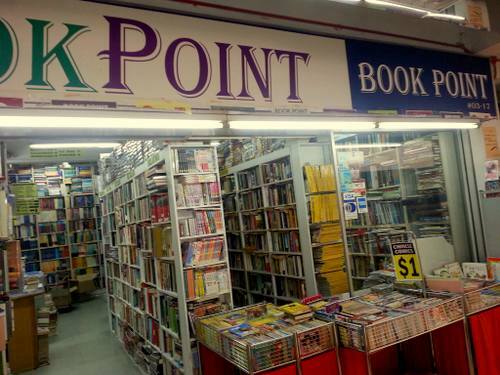 Founded in 2006, Book Point is Singapore’s biggest pre-owned (used) / rare / hard to find /out of print books & new books store that both retails and distributes books wholesale. Visiting the shop, you can find a wide range of text books, reference books, professional books, fiction, non-fiction, as well as general books for all ages. Overall, Book Point holds more than a half-million titles in wide range of subject areas for customers of all ages, levels and interests, from educational resources to recreational reading materials. Popular categories include story books for children, academic books for teachers and students, technical books for professionals, and general reading books for all. In total, Book Point has over 30 categories of books – Engineering & Science, Fictions, Classics, History, Politics, Language, Children, Dictionary, Philosophy, Humanities, Arts, Travel and more – all under one roof. The official Facebook page for Book Point bookstore is located at www.facebook.com/BOOKPOINTPL/. Following the Facebook page, you’ll receive updates about the bookstore’s newest titles, their promotional offers, and more.